Great Western Railway 43002 Sir Kenneth Grange has entered traffic in its 'Flying Banana' Inter-City 125 livery following its unveiling at the St Philips Marsh open day. For more on the power car, read RAIL 800 published on May 11. 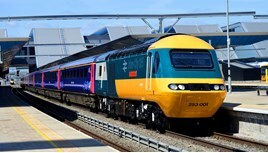 For more on GWR's plans for HSTs, read RAIL 801, published on May 25. Relivered in how the Class 43 HST's were before back in the 1970's. Such a iconic livery the Class 43's had. The livery was about how our British trains were built and served the West Coast Main Line, East Coast Main Line and Great Western Main Line before they are to be replaced by the Hitachi IEP Bi-Mode and Electric Trains with the Class 91's used on the ECML are also to be replaced with the MK4 carriages could be used on the Class 90's MK3 fleets on the London Liverpool St-Norwich Intercity route.